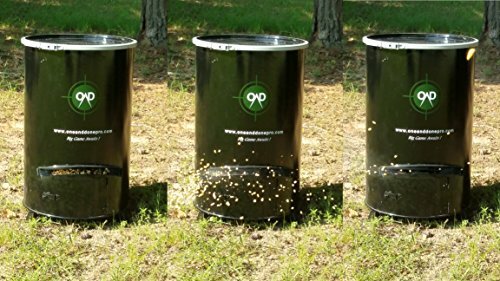 The One And Done PRO Feeder is the most efficient and durable feeder in the market today. With multiple patented designs, it will soon set the standard for how future feeders are built. No assembly or tools necessary! Simply set the feeder at any location, pour in the feed, set the digital timer and big game awaits! No assembly or tools necessary, can be setup anywhere by anyone. The OAD feeder can be placed on the ground, strapped to a tree (bracket included), or on a traditional tripod. Multi-patented directional feeder allows for the most accurate throw and calculation of how long the feed will last. 55-gallon drum holds up to 250 lbs. 1 cup of feed covers the widest field range in the industry which saves you time and money. Works with Floating Fish Food .125" to .50" in diameter. Smart Program TM digital timer allows you to schedule up to 6 feedings a day. Customize feed dispense time between 1-99 seconds. Can operate on as little as one 12-volt battery (not included) or up to as much as a car battery. No need for solar power. High impact structure allows for battering resistance. Bear and hog proof. Designed without plastic pieces that can be chewed on by rodents. GMAW welding for more durability and reliability. Most versatile feeder in the market! Spend more time hunting and less time worrying about broken feeders! If you have any questions about this product by One And Done, contact us by completing and submitting the form below. If you are looking for a specif part number, please include it with your message.